Each year Kellogg’s buys 100,000 tonnes of English wheat to turn into Bran Flakes, All Bran and Special K at its factory in Wrexham. Most wheat is sourced from a group of growers in Yorkshire and Northamptonshire, including grains grown at our Allerton Project farm. The market for breakfast cereals across Europe is becoming increasingly sophisticated with less emphasis on products that are eaten from a bowl with milk, to cereal bars and multi-grain products which can be eaten ‘on the move’. However, consumers are increasingly interested in knowing the provenance of the food they are buying, as well as being reassured that it is being grown in an ethical and environmentally sustainable way. To ensure this, Kellogg’s set up its first farmer supply group two years ago among its Spanish rice growers, who grow the grains for Special K and Rice Krispies, and then in 2013 a wheat group in the UK. Kellogg’s brings the farmers, known as the ‘Origins’ group, together twice a year and provides them with free technical information from industry experts. 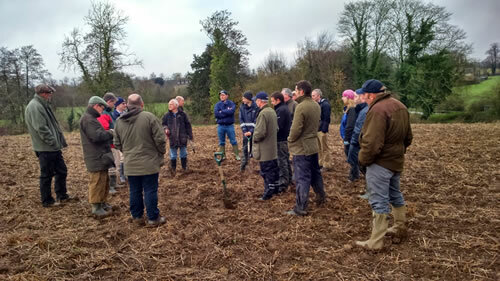 Several of these have been held at our new training centre at the Allerton Project and involve subjects such as black grass management, crop nutrition and the role soil biology can play in plant health. In addition, we have a contract with Kellogg’s to provide one-to-one visits to its farmers to provide advice on aspects of environmental management and Stewardship schemes, and from 2015 we will be assisting with the administration of the overall Origins project.